Moshchevaja Balka was initially introduced to the academic community at the beginning of the 20th century by Russian Archaeologist Nikolay Veselovsky, who opened five of the graves. Because of how well preserved the graves he opened were, Veselovsky relegated his finds to the ethnographic rather than archaeological section of the Russian Museum. Russian archaeologist N.I. Vorob’ev followed Veselovsky in 1905 and collected 800 objects for the Kuntskammer of Czar Peter I. These were transferred to the Hermitage in 1935 and joined by the Veselovsky finds in 1951. The Hermitage maintains the largest collection of items from Moshchevaya Balka to this day. The site was next visited in 1950 by A. A. Iessen, who was the first to provide a truly complete, academic description of the site. Anna Ierusalimskaja was appointed curator of the North Caucasian antiquities collection at the Hermitage in 1962. With a series of articles (in Russian and German) and four excavation campaigns between 1969 and 1976, she has contributed the most to our understanding of the site. She is the author of the most complete record of the site Die Gräber der Moščevaja Balka, from which comes the majority of my documentation for this hat. The color photos I have of the hat were posted by user Gostjata on a Russian photo hosting site (http://photo.qip.ru/users/zlodey30/3995452/). The black and white photo is from Die Gräber der Moščevaja Balka. (Anna A. Ierusalimskaja, Die Gräber der Moščevaja Balka: Frühmittelalterliche Funde an der nordkaukasischen Seidenstrasse (Munich: Editio Maris, 1996), 37, Tafel LXXIX.) The photos of my progress and finished product are my own. Es handelt sich um eine hohe, kegelförmige Kopfbedeckung mit hölzerner Spitze, die aus Leder gearbeitet und vermutlich mit Rohleinen unterfüttert wurde. Sie ist mit einem festen Seidengewebe überzogen. An der Stelle, an der in einer Öffnung über dem Scheitel die Holzspitze angebracht wurde, ist an deren Basis ein kleines Stückchen vergoldetes Leder, offenbar der Rest einer Verzierung, erhalten geblieben. Das kegelförmige Oberteil ist aus vier langen, spitzwinkligen Zwickeln zusammengesetzt (Fig. 2-c). Das Unterteil besteht aus einem breiten Streifen, der waagerecht an das Oberteil angenäht wurde und sich den Enden zu etwas verbreitert. Dieses untere Teil umschloß den Hals und reichte bis an die Schultern. Auf der linken Seite ist ein Knopf erhalten geblieben, mit dem durch Schlaufe oder Band der Helm wohl unter dem Kinn zugeknöpft wurde. Das tief herabreichende, über den Brauen rundlich ausgeschnittene Oberteil verdeckte zum großen Teil die Stirn. Das unterhalb der Helmspitze angebrachte Schleifchen aus feiner Seide diente wohl als eine Art Apotropäum – als Schmuck wäre es allzu unauffällig. Eine magische Funktion dürfte auch die Helmspitze selbst gehabt haben; von der wichtigen Rolle der Stäbchenamulette war bereits die Rede. Die Form des Helmes an sich wie auch die innenliegende Lederschicht lassen vermuten, daß es sich hie~: wenigstens dem Ursprung nach, um eine Kriegerkopfbedeckung handelte. Ihr repräsentatives Außeres aber legt nahe, daß sie einem angesehenen Stammesmitglied (vielleicht sogar einem Stammesfürsten?) gehört hat. This type is a high, conical hat with a wooden tip, which has been worked out of leather and has probably been lined with undyed linen. It is covered with a solid silk fabric. At the point where the top of the wood is placed in an opening above the apex, a small piece of gilded leather, apparently the remains of an ornament, has been preserved at its base. The conical upper part is composed of four long, pointed panels (Fig. 2-c). The lower part consists of a broad strip, which has been sewn horizontally to the upper part and widens slightly to the ends. This lower part of the hat covered the neck and reached to the shoulders. On the left side, a button has survived, with which the helmet has been buttoned under the chin by a loop or band. The strongly pointed top, cut round the eyebrows, covered the forehead. The bows/loops of fine silk, which were placed below the point of the helmet-hat, probably served as a kind of amulet – as jewelry it would be all too inconspicuous. The helmet-hat itself might have had a magical function; the important role of the rod-shaped amulets have already been mentioned. The shape of the helmet, as well as the inner leather layer, suggest that it was, at least in its origin, a warrior’s head covering. But its decorative appearance suggests that it belonged to a respected tribe member (perhaps even a prince of the tribe?). Blue and black silk brocade – I was unable to obtain proper Sogdian silk for a number of financial (and historical) reasons. 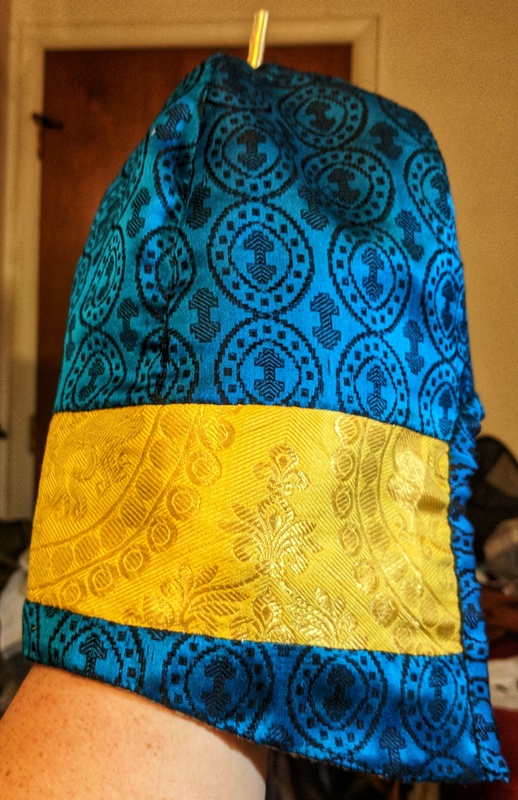 The top and bottom line of trim on my hat is made of a bright blue silk/poly in a pattern very similar to the pattern of the silk that appears on the Met caftan (believed to come either from Moschevaya Balka or from a related burial). Frustratingly, both the gold and blue brocades are largely monochromatic, unlike the silk preserved in the hat. Unfortunately, I was not able to find polychromatic silk brocade in appropriate designs within the timeframe of the contest. I elected to go with monochromatic fabric in temporally appropriate designs rather than use polychromatic fabric in anachronistic patterns because I really like the blue fabric (which looks like TIE fighters). Linen – The linen used to line the hat was undyed as suggested by Irusalimskaya. There is no indication of wool-on sheepskin in the images or description of the hat, but it is possible that the leather is sheared sheep. I sent an email to the Hermitage Museum asking what kind of leather was used to construct the hat, but did not hear back. The hat in the images looks quite stiff, indicating that a non-garment-type leather might have been used. However, it’s hard to make such a judgement call given the age of the piece and the fact that leather hardens over time. Ultimately, I elected to use a garment-weight leather as that seemed more comfortable to wear. I did not have any sheepskin on hand, but I did have garment-weight goat, so I used that on the theory that goats and sheep are closely related and goat leather is more likely in this context than cow leather. Gilded leather – Irusalimskaya states that “a small piece of gilded leather, apparently the remains of an ornament, has been preserved at [the base of the peg of wood inserted in the top of the hat]” There is no indication of what shape the ornament took, whether it covered the peg or was around it, or the method of gilding the leather in Irusalimskaya’s descriptions. However, from the image below, it appears that the gilded leather may have simply covered the wooden tip, or at least its base. As this is the only information I have available, this is what I have elected to do. No information was available about the thread used to sew the hat together. I chose to match type with type and used silk thread for the silk, and linen thread for the linen and leather. The thread was waxed, I have no evidence that thread used at Moschevaya Balka was waxed, but I find it makes the thread easier to use. I went scrounging for wood for the tip in the park by my house. I whittled a piece of birch into approximately peg shape. I was unable to find any additional information on specific manufacture techniques from Moschevaya Balka in either Irusalimskaja’s works or any of the other articles I could find. I cut my hat according to the pattern described above. Because of the size of my head and my desire not to make a 8th century hennen, my pieces appear more angular than the drawing from Die Gräber der Moscevaja Balka. However, when you look at the photos of the actual piece, you can see some angularity above the seam line. Using a closely sewn running stitch, I sewed the leather panels together with waxed linen thread, right sides together. My choice of running stitch was based on the weight of the leather and what stitches I was comfortable with. There is possible evidence that this was a technique used to sew leather together in the shoes that were preserved at Moshchevaya Balka. Diagrams of the shoes appear to show seams sewn together with regular stitches, right sides together. (See http://members.ozemail.com.au/~chrisandpeter/MB_footwear/MB_shoes.htm, accessed September 15, 2017.) The evidence however requires a definite leap of faith (especially since my conclusions are based on drawn diagrams, not actual photos of the shoes), so I am not comfortable saying that this is definitely a period thing. After the panels were put together, I used the same stitch to attach the lower part. However, instead of sewing the upper and lower parts right sides together, I overlapped the pieces, right side to wrong side. I felt like this would lit better and avoid bulk at the points where the lower part met the seams in the panels of the upper part. Again, looking at the diagrams of the shoes, it appears that there is some evidence of leather being sewn right side to wrong side. However, the same caveat about diagrams applies. I cut the panels of the upper part of the silk shell to the same pattern as the leather core. In the extant example, piecing can be seen in panels of the upper part of the hat. This is likely because the pieces of silk used to construct the hat were not large enough. The piecing appears on multiple panels and no care appears to have been taken to match the patterns. Initially, I planned to mimic the piecing. 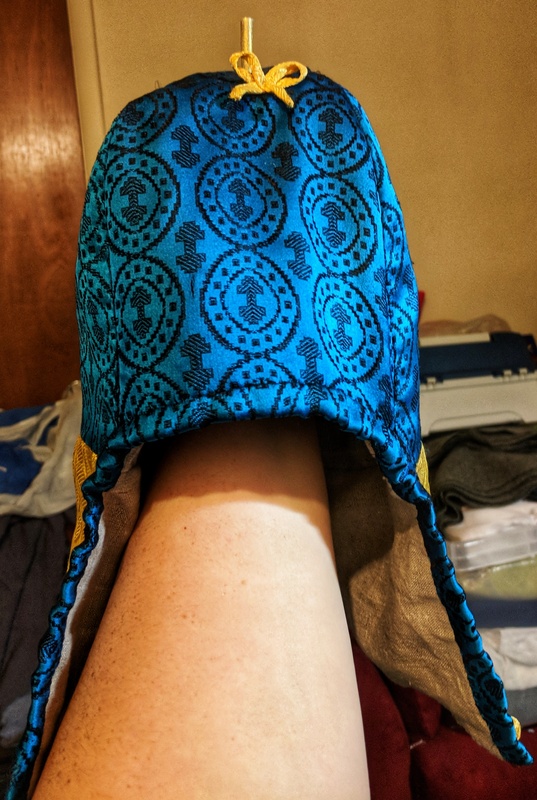 However, the fabric I’m using to construct the upper part of the hat is flimsy and delicate (and a pain to work with), so I decided not to deal with the mess this would cause. I used backstitch to sew the panels together. I used backstitch because it creates a strong, locking seam. I have no evidence that this is what was used. I did not finish the seams because there is no evidence in the pictures of the bulk of a french seam or prick stitches from a folded over seam. The lower part of the original hat is made of (at least) two different fabrics, a striped fabric and a band at the bottom that matches the fabric of the upper part. To replicate this, I cut the lower part in two pieces and sewed them together with a back stitch. I connected the lower part with the upper part. The linen lining was constructed in the same way as the silk shell, but out of undyed linen instead of silk. Additionally, the lower part was cut in a single piece. The sewing was done with linen thread. Guys, I hate hand-sewing so much. SO MUCH. I started with a birch stick that had broken off one of the trees in the park. I whittled it down to a small peg and let it sit to dry out. I made the glair using egg whites and water and let it sit for three days. This allows the “sticky bit” to condense and become stronger. I painted a small, pre-cut piece of leather with the glair and applied 23k gold leaf. I painted the peg with the glair and attached the leather. This didn’t stick AT ALL, so I sewed the leather down. I made the ribbon for the bow by folding a piece of the gold fabric so that the edges were hidden and sewing the folded edge together with a whip stitch. I have no information on whether or not this is how the original ribbon was produced. The button was made out of a piece of the blue fabric. I followed the standard method for making fabric buttons (gathering the edges together inside the button and sewing it closed. I have no information on whether or not this is how the original button was produced. I layered the silk, leather, and linen in that order and used a whip stitch to secure the face opening. I closed the bottom by folding the silk and linen inward and whip stitching those layers together with silk thread. 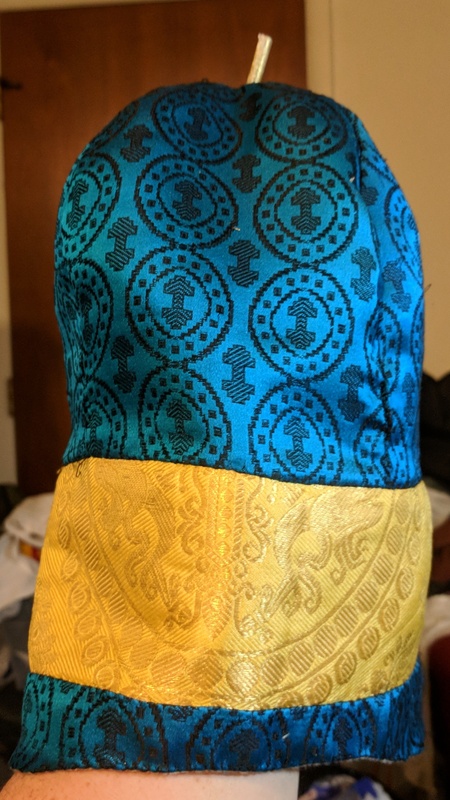 I finished the face opening with a piece of bias tape made out of the blue fabric (as it wouldn’t be melted by an iron). In the original, you can see the remnants of edging around the face, but not the bottom of the hat. I attached the button at the bottom of the face opening, as it’s shown in the sketch and described by Ierusalimskaja (but not the photo). This made more sense to me than a button randomly on the side of the head. The final step was attaching the bow and peg. The bow was attached with stitches that went through all three layers of the hat. The peg was inserted, and then stitched firmly to the top of the hat. This hat looks goofy as hell and I don’t know if I’ll ever wear it in public. However, the original hat is also pretty goofy, so there’s that. The fabric is appropriate to both time and place. I’m pleased that I can now say I made an item of clothing completely by hand. The hat isn’t quite the right shape, I think this is because my panels are squatter and squarer than the originals. If I make such a hat again, I think I need to elongate the panels more rather than try and copy the image in the diagram. The stitching is not very neat. To improve this, I need to work on hand sewing more. Blerg. The original has the silk fitting tightly over the leather. I don’t know if this is because of the leather stretching out, time in the grave, or if it was just made that well. Either way, my silk looks very sloppy in comparison. I think I could get it to fit more closely if I sewed the silk over the leather while it was on a form. This would support the leather so I could do a more careful job fitting the silk. The colors are really loud. Unfortunately, this is a product of these being the most temporally appropriate fabric I could find.